Thanks to Nadine at Life by Nadine Lynn for this post idea! I was overwhelmed by the amount of people I went to high school with - there were over 700 in my graduating class alone. I was awful with names and only so so with faces. The best chance of me knowing someone was if I went to elementary and junior high with them too. I told it like it is then just like I do now. I like to think I'm more tactful now as an adult but that's probably not true. Blunt seems to be in my bones. You had to do research and find people and things. Computers, email, cell phones were not a thing. I remember some class in the business center with word processors and that crazy computer paper. I never used those skills again after leaving that room. Homeroom made me feel awkward because it was early, pointless, and I was bad at small talk but I didn't know to feel okay about hating small talk back then so I just felt awkward and weird. Talking about being tired seemed to be my fall back. I totally looked forward to the History Club trips. We laughed so much. I remember them fondly. I don't know what we're doing, but it was apparently funny. I was frequently tardy senior year, mostly because I was up late talking on the phone and listening to Christopher Knight on the radio. When I said I'd be friends with my core group of friends forever, I meant it. I still have the same best friends now as I did then. The guys too, they're just not pictured here. I had lost touch with some other friends but reconnected with many through Facebook, which has been nice. I didn't sleep a wink the night before the first day of sophomore year. I was in a distracted daze due to my parents' split and eventual divorce for most of junior and senior year. A lot of daily life details from that time have slipped my mind. I nearly crashed my car searching blindly on the passenger side floor for the mixed tape with Hey Jealousy on it. I did crash my car while driving with Jenny to Gym Night practice on the winding road through Parkland from Penndel to the high school. Maybe now is a good time to mention I failed my driver's test four times. I'm a good driver though, I swear! I went to and hosted parties but was a goody goody at heart and never wanted to get in trouble. I liked school and my teachers a lot. Except for Mrs. Fricke's Algebra II class. I really loved the view of the drive coming in and the stadium. I still do. I also love that it's called Heartbreak Ridge. Everything seemed urgent and important...99% of it wasn't. I didn't believe in school dances and had zero desire to attend any of them. 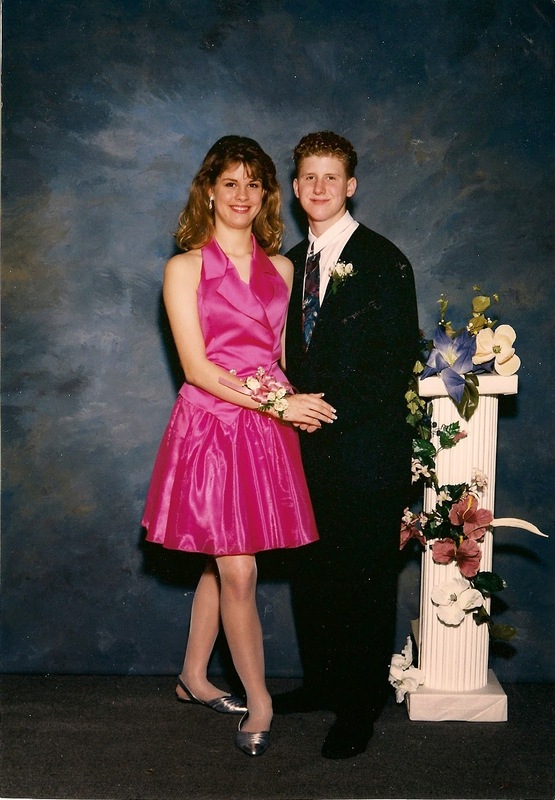 I only went to the senior prom because my mom wanted me to. Laura went to all the dances, including the sophomore dance with MFD, who was late picking her up because he was getting a hair cut. I love that story and that it is still applicable today - Laura is still always on time and MFD is still frequently late due to hair cut timing issues. I never cleaned my room and there were huge piles of clothes everywhere. The thought makes me want to die now. I was an idealist and then all of the sudden I wasn't. That felt liberating and adult. I worked 20-30 hours a week at Macy's and chose work over senior week after senior year. I loved making my own money and I still do. I loved a lot of things about Gym Night, which is weird because I'm not competitive, I wasn't a good athlete, and I don't like dancing in front of people. I enjoyed writing and thought it would be easy to crank out a best selling novel. Fiction has been an elusive mistress in the ensuing 19 years so here I am with a blog because I still enjoy relating through writing. Now you. Tell me about you in high school. I wasn't the best kid in high school, but I had an awesome time! This is a great idea! I think I'll do as Kenzie mentions as well. Also, I'm totally with you on the work over school. Making money was more important to me than other "life experiences"...which is why I've worked continously since high school. (even multiple PT jobs in college) I've never NOT worked since I started working at 15. Such a good idea. The pictures are priceless. Oh the fashion. 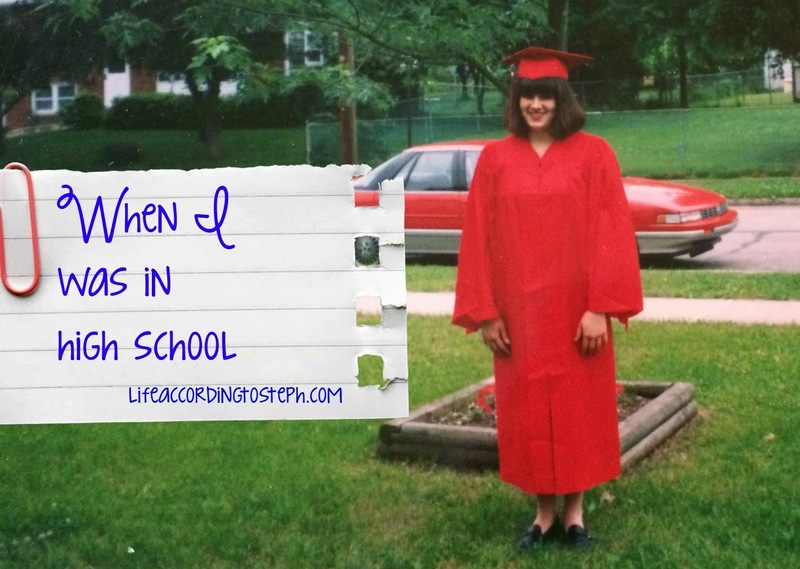 I had a really good time in high school, but I was a good girl too. I was an athlete but also in the smart classes. I was a little bit of a smart alec too, school bored me. I was lucky enough to attend Neshaminy High School as a baby boomer. 10,11,12 grades. Same as you but with 1,100 in my class alone with the other 2 grades just as plentiful. My life included triplet siblings born when I was 13. I was a majorette. I am so happy a of you girls have stayed so close. You have all been there for each other over the years. So nice most of you have college degrees! Nice seeing the red flash in the background of that picture. Yay you posted it! Thanks for the shout out! Seems like we were both good girls in high school, and both chose work over some of the silly activities that kids partake in. I love all the high school pictures and the fact that you are still friends with all of those people! I am friends with very few people from high school, but I only went there for 2 and a 1/2 years so there's that. Homeroom was always super awkward!!! "Everything seemed urgent and important...99% of it wasn't." Yes! That was me - was that most high school girls? LOL...I love this post, Steph. Also, Hey Jealousy was a really good song, damn it! I have Hey Jealousy in my head now lol. I love everything about this. I may steal this idea from you & Nadine except I'll have to wait until I'm back at my parents' to get some HS pictures. 700 is an insane amount of kids to me! My entire HS was 7-12 with less than 1000 kids. This brought me down memory lane - great idea! might need to jump in on this post idea!! so brilliant. so many memories. i graduated 19 years ago fr hs. i feel ancient!!! I loved reading this. It all sounds so American (in a good way, I love it!). But that computer paper, I remember that! lol. I hated computers class. I was definitely a 'goody goody'. Great post!!! maybe I'll turn this into a Friday Fave post - You have inspired me! Still working on tomorrow's post - and by working on it - the pictures are the only thing in the post currently. So many things that I know now that I wish I knew back then! I was not a goody goody. I was your typical Catholic school girl who wasn't all that Catholic school girl-ish. I did always have a job though, and like you, loved earning my own money. One of the (many) reasons I will never be a stay at home mom. I feel like high school kids these days are a lot less mature than we were. It seems like so many kids don't have jobs anymore, no one is in a big hurry to get their drivers license, etc. I was taking my permit test on my birthday and took my drivers test a month later. I was not wasting any time. I love that you have the same friends now as you did then. I still have one friend from high school (we've been friends since the sixth grade) and talk to a couple via Facebook now. It doesn't bother me, and I still haven't decided if I'm going to bother with my 20th(!) reunion. I didn't do much during high school and didn't start cutting class until senior year. Then I couldn't stop. I feel like I want to do this post (and I said the same to Nadine when she did it) but I was so boring, it'd be a waste of a post. I love that you are still friends with your core group of high school friends!! 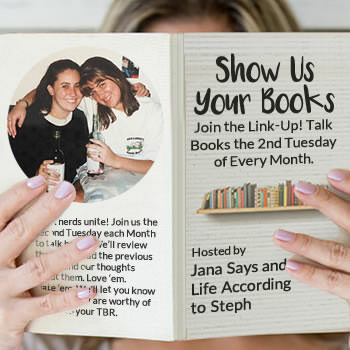 I love this post idea - and I'm definitely stealing it!! OMG, high school!!! I feel like that was a lifetime ago now. I used to think everything was like so dramatic back then. Meanwhile, I had hardly any bills, went out with friends and even liked some of my classes. I was pretty much an average student and had my tight group of friends. College was so much better though and I was so happy to be out of high school at the time. Oh and I totally remember using encyclopedias to do research for papers!! Oh I love this post too. I was not a big fan of high school but I do have some amazing memories. Might have to give this one a go too:) Love those BANGS!!!! It's nice to reminisce about high school and see what's changed and what's stayed the same. It's great that your still close with your core group of friends. i am too and it's great to grow together. I love this, such a good idea for a blog post. I would consider copying you and doing it too except I basically have ZERO pictures of myself from high school - they're all at my mom's house, and I can't exactly drive over and grab them, haha. I was the girl everyone was scared of in high school, not a bully but not afraid to fight if I needed to. Apparently I needed to at least twice. Great post! I love this idea. I think I know what computer paper you're talking about. Was it the paper with the perforated edges that you had to tear off?? I totally forgot about that! It's crazy to think that cell phones weren't really a thing in high school. Well actually, my mom had this huge cell phone with a long antenna that she would put in the glove box of the car whenever I would go out just in case the car broke down. I'm not really sure why since my friends and my boyfriend pretty much all lived out in the middle of nowhere and the phone never would have worked out there anyway. It's awesome that you've stayed such good friends with the same group of people. I'm still best friends with my friends from middle school. We definitely have so much dirt on each other. Hah. This is such a fun post!!! I swear I can't even remember much about high school except that we had a lot of parties on dirt roads...ha! My class was huge too...almost 600. Sadly, I really don't keep in touch with many of my HS friends...just a few. 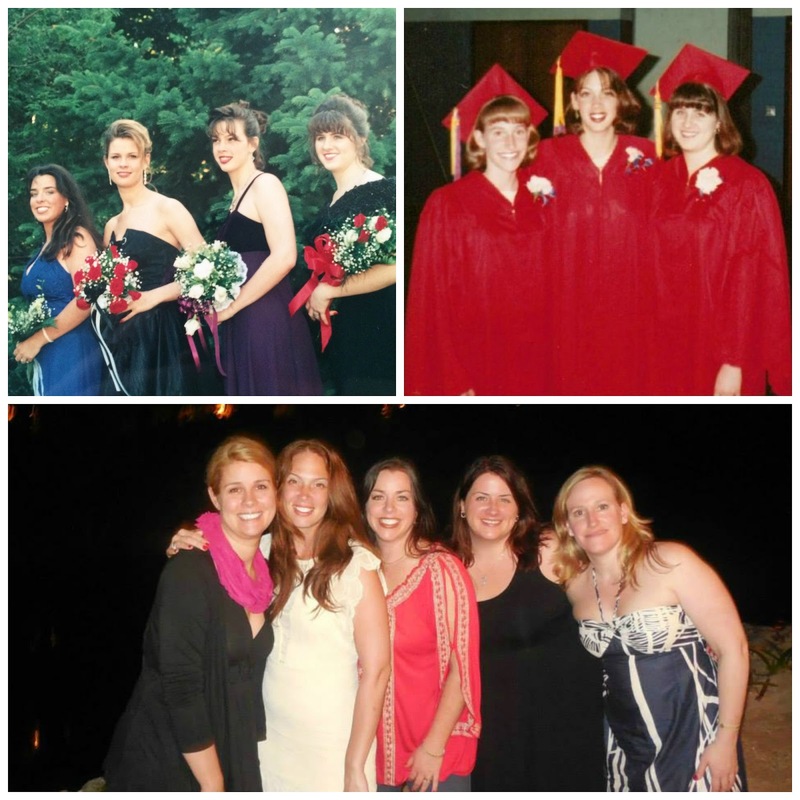 My college girlfriends are who I stay most connected with. Anyway...you were babe! :) And that pic of MFD is awesome!!! whoa! High school was soooo long ago. I am not in touch with most from high school except through Facebook. I love that you still have the same core group of friends. You failed your driving test 4x!!!??? That is so weird to me since you loved school. It is like the driving tests and school go hand and hand. I was a goody goody and worked a lot for spending money in high school too. I wonder if kids still take computer classes? Oh, my, I love everything about this post- I may have to thieve it! I was a much different person in high school so I think this would be a fun post! Also, don't hate me...but I love the bangs. Ever consider bringing them back 2014 style???? This was fun to read. I was a nerdy "good girl" in high school, never went to parties (not invited, not because I was snobby) and I definitely wasn't a jock but I did run in track and cross country. (We're our own breed of weirdos.) I also did band, choir, and sometimes drama, but mostly hung out with the same small group of girls that I had been friends with since elementary school. Sadly we all live far apart and just keep in touch with facebook and Christmas cards these days. I never went! Awful but true! This is such a great post! Hey Jealousy!!! I still love that song. I love all the hair, especially the bangs! I was never really into dances either. A lot of times we went, took pictures, danced to maybe two songs and left for bowling or an after party. MFD looks 9 years old in that picture!